The OMG-ULTRA-485 provides a PC with a direct RS422/485 asynchronous link to data collection and other devices. Individually selectable address and extended 'AT' interrupts make for seamless integration into OS/2 and Windows. The OMG-ULTRA-485 eliminates communications roadblocks under Windows and OS/2 due to its advanced design. 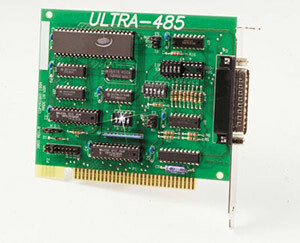 The OMG-ULTRA-485 is perceived by the system to be an RS232 port, so no special drivers or additional software is required. WIN XP/Vista/7 drivers are included as well as support for Linux. The drivers provide IRQ sharing, advanced UART support, and Windows serial diagnostics.